People said “The Evening Bell is sounding, the sun is setting.” For a strange wondrous tone was heard in the narrow streets of a large town. It was like the sound of a church-bell: but it was only heard for a moment, for the rolling of the carriages and the voices of the multitude made too great a noise. A long time passed, and people said to each other—“I wonder if there is a church out in the wood? The bell has a tone that is wondrous sweet; let us stroll thither, and examine the matter nearer.” And the rich people drove out, and the poor walked, but the way seemed strangely long to them; and when they came to a clump of willows which grew on the skirts of the forest, they sat down, and looked up at the long branches, and fancied they were now in the depth of the green wood. The confectioner of the town came out, and set up his booth there; and soon after came another confectioner, who hung a bell over his stand, as a sign or ornament, but it had no clapper, and it was tarred over to preserve it from the rain. When all the people returned home, they said it had been very romantic, and that it was quite a different sort of thing to a pic-nic or tea-party. There were three persons who asserted they had penetrated to the end of the forest, and that they had always heard the wonderful sounds of the bell, but it had seemed to them as if it had come from the town. One wrote a whole poem about it, and said the bell sounded like the voice of a mother to a good dear child, and that no melody was sweeter than the tones of the bell. 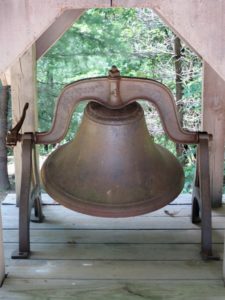 The king of the country was also observant of it, and vowed that he who could discover whence the sounds proceeded, should have the title of “Universal Bell-ringer,” even if it were not really a bell. Many persons now went to the wood, for the sake of getting the place, but one only returned with a sort of explanation; for nobody went far enough, that one not further than the others. However, he said that the sound proceeded from a very large owl, in a hollow tree; a sort of learned owl, that continually knocked its head against the branches. But whether the sound came from his head or from the hollow tree, that no one could say with certainty. So now he got the place of “Universal Bell-ringer,” and wrote yearly a short treatise “On the Owl”; but everybody was just as wise as before. It was the day of confirmation. The clergyman had spoken so touchingly, the children who were confirmed had been greatly moved; it was an eventful day for them; from children they become all at once grown-up-persons; it was as if their infant souls were now to fly all at once into persons with more understanding. The sun was shining gloriously; the children that had been confirmed went out of the town; and from the wood was borne towards them the sounds of the unknown bell with wonderful distinctness. They all immediately felt a wish to go thither; all except three. One of them had to go home to try on a ball-dress; for it was just the dress and the ball which had caused her to be confirmed this time, for otherwise she would not have come; the other was a poor boy, who had borrowed his coat and boots to be confirmed in from the innkeeper’s son, and he was to give them back by a certain hour; the third said that he never went to a strange place if his parents were not with him—that he had always been a good boy hitherto, and would still be so now that he was confirmed, and that one ought not to laugh at him for it: the others, however, did make fun of him, after all. “That surely cannot be the bell,” said one of the children, lying down and listening. “This must be looked to.” So he remained, and let the others go on without him. They now let him go on alone; and as he went, his breast was filled more and more with the forest solitude; but he still heard the little bell with which the others were so satisfied, and now and then, when the wind blew, he could also hear the people singing who were sitting at tea where the confectioner had his tent; but the deep sound of the bell rose louder; it was almost as if an organ were accompanying it, and the tones came from the left hand, the side where the heart is placed. A rustling was heard in the bushes, and a little boy stood before the King’s Son, a boy in wooden shoes, and with so short a jacket that one could see what long wrists he had. Both knew each other: the boy was that one among the children who could not come because he had to go home and return his jacket and boots to the innkeeper’s son. This he had done, and was now going on in wooden shoes and in his humble dress, for the bell sounded with so deep a tone, and with such strange power, that proceed he must. “Why, then, we can go together,” said the King’s Son. But the poor child that had been confirmed was quite ashamed; he looked at his wooden shoes, pulled at the short sleeves of his jacket, and said that he was afraid he could not walk so fast; besides, he thought that the bell must be looked for to the right; for that was the place where all sorts of beautiful things were to be found. “But there we shall not meet,” said the King’s Son, nodding at the same time to the poor boy, who went into the darkest, thickest part of the wood, where thorns tore his humble dress, and scratched his face and hands and feet till they bled. The King’s Son got some scratches too; but the sun shone on his path, and it is him that we will follow, for he was an excellent and resolute youth. But on he went, without being disheartened, deeper and deeper into the wood, where the most wonderful flowers were growing. There stood white lilies with blood-red stamina, skyblue tulips, which shone as they waved in the winds, and apple-trees, the apples of which looked exactly like large soapbubbles: so only think how the trees must have sparkled in the sunshine! Around the nicest green meads, where the deer were playing in the grass, grew magnificent oaks and beeches; and if the bark of one of the trees was cracked, there grass and long creeping plants grew in the crevices. And there were large calm lakes there too, in which white swans were swimming, and beat the air with their wings. The King’s Son often stood still and listened. He thought the bell sounded from the depths of these still lakes; but then he remarked again that the tone proceeded not from there, but farther off, from out the depths of the forest. And he seized hold of the creeping-plants, and the roots of trees—climbed up the moist stones where the water-snakes were writhing and the toads were croaking—and he gained the summit before the sun had quite gone down. How magnificent was the sight from this height! The sea—the great, the glorious sea, that dashed its long waves against the coast—was stretched out before him. And yonder, where sea and sky meet, stood the sun, like a large shining altar, all melted together in the most glowing colors. And the wood and the sea sang a song of rejoicing, and his heart sang with the rest: all nature was a vast holy church, in which the trees and the buoyant clouds were the pillars, flowers and grass the velvet carpeting, and heaven itself the large cupola. The red colors above faded away as the sun vanished, but a million stars were lighted, a million lamps shone; and the King’s Son spread out his arms towards heaven, and wood, and sea; when at the same moment, coming by a path to the right, appeared, in his wooden shoes and jacket, the poor boy who had been confirmed with him. He had followed his own path, and had reached the spot just as soon as the son of the king had done. They ran towards each other, and stood together hand in hand in the vast church of nature and of poetry, while over them sounded the invisible holy bell: blessed spirits floated around them, and lifted up their voices in a rejoicing hallelujah!